“And sir, What’s the certainty that you won’t want happiness again after you’ve gone through the happy portion of your life?” screamed Ishan. There are only two types of people in the world. One, who are happy. And rest, who want to be happy. Ishan is a lawyer, as you might have noticed by the way of his interruptive screaming. He was not yet a professional, a newbie, learning through his cases. He had always admired how the Pro Lawyers would put up intelligent questions in a stressful way to the clients making them confused, and making them spit out the truth or whatever the lawyer wanted. He was a good learner. He didn’t take much time inhibiting all the qualities of a lawyer, from the lawyers he was inspired from. “I won’t. I know my limits. I’ve always known them. One can’t get everything in life. If one climbs up the hill, he has to walk down as well,” said Manoj, the convict, in a calm tone, with a hope of convincing Ishan that he’s not wrong on what he wants from the court. “So, you say, you know your limits. Okay, then let’s go back to the date 1st November 2001. Would you tell me, sir, where were these limits of yours when you murdered your wife with kitchen knife ?” argued Ishan, in a deep tone as always. The jury had convicted Manoj of killing his wife in 2001 and sentenced him to life imprisonment. “No. I loved her and I couldn’t see her with someone else,” argued Manoj. This time in an angered tone but still not matching up his eyes with Ishan. Manoj had always loved his wife. They had a love marriage in 2000. It had been just a year and 3 months when this happened. They had not yet planned for a child yet. But, they were happily married, at least it looked so till the first anniversary. “Sir, as far as I know about your wife, from my sources,” flipping his file as he continues, “she was a happy-go-lucky lady. She loved to live life the way she wants to. She was optimistic and tried to acquire the good things she appreciated in others. “Actually, her Boss was her childhood friend. He had opened up this call center of his own and was pleased to offer the job of Secretary to my wife when he got to know that she was seeking one. I never had a problem with her talking about him or appreciating him. “Yes.” Manoj replied in a very weak tone. A sense of loser drawn up on his face, he didn’t look up at all. Yet, there was a lot to be told. “Okay, then, let me question you for what we are here, why…Why did you try to commit suicide when you had already got what you wanted? Suicide’s a characteristic of a loser. And, you ain’t a loser, are you? You are a winner perhaps, you succeeded in your target, didn’t you?” enquired Ishan, with no sense of feelings for Manoj. Rather, he was proud with the way he was handling the case. It seemed to him that the case was falling on his side. Manoj was asked to appear in the court on 13th November 2011 for he had attempted suicide by banging his head on prison walls, but failed. Loser Manoj, somehow, almost in tears, answered him, ” I’ve been in the jail for 10 years now. I had nothing to do inside the cell but to think about the past. Me and my wife have had some very good memories that made my life worth living and probably gave me much more happiness than I expected from life. I used to spend whole of my time thinking about everything that happened and its effects. I used to cherish those few best memories of my life and think about them again and again. My wife, Meera was just as you described.” The first smile for the day appeared on Manoj’s face as he was speaking, “She always remained happy and spread happiness. She loved to see and make people smile. She was filled with goodness and I loved her for the way she was. .
“I had this friend named Shweta who wasn’t married and, sometimes, I used to invite her to dinner at our Home. She was one of my best friends who had been there for me all the time. But we never really looked like we were just good friends. We used to fight a lot, for silly things, most of the time. We had been college friends and knew each other really well. She used to describe funny instances that me and Shweta shared during college life. Meera, used to just smile. She never showed a tinge of doubt on her face or a spark of jealousy. Tears kept rolling from Manoj’s eyes as he spoke. For that one moment, after hearing all the explanation, Ishan was dumbstruck. He didn’t have any questions in his mind. He was blank. He felt weirdly right for Manoj. This shouldn’t have happened. His mind was trying to remind him that he’s fighting the case against the convict and that he’s not the defender. Though his heart was melted with Manoj’s story, he had to continue his duty. “Sir, then why did you say you wanted happiness? How would you get it now? Meera’s not here anymore. What would you do if you are freed from the prison?” asked Ishan, now in a respected and calm voice. This question, by Ishan was due to his instincts. This didn’t arise from mind. Rather, from the heart. He wanted to know how, if Manoj was sane, would live his life if given a chance for few days. “I’d live the way she did. I’d be happy seeing people smile and make people smile. I’d work and earn. And, I’d spend the nights at home where I have all of her things and our memories. Those would be enough for me to make my life worth living. That’s why I asked the court for some days of freedom. Otherwise, I don’t really see a reason for living.” answered Manoj, and finally lifted up his face, for he felt light at heart now, sharing all he wanted to share. “No more questions, Your Honour.” said Ishan, ashamed at how he was being rude at Manoj at first. The Judge then asked if Defense wants to say anything. Manoj smiled back at the defense. “The Court, after hearing to all the explanations given by Mr. Manoj Sharma for his attempt of suicide, and the points of both sides, finds him guilty of murdering his wife and imposes sentence for the time served. Thus, Mr. Manoj you are guilty and you are free to go. The court is dismissed.” declared the Judge(and bangs the gavel). so now when i got the real meaning of the post..
but still i say..manoj did a very wrong thing..
and the world is so bad and mean.. he could have given divorce to her.. instead of killing.. people kill each other because of small misunderstandings.. and whatever.. doesn’t matter whatever the reason is.. you don’t have right to kill anyone..
Jealousy has no limits. And, a person turns blind in it. but mr.author….killing your loved one even…jealousy turned things dis way…disagree…!!!! Aarti, that happens in today’s world. You’d heard of cases even…its not anything new. 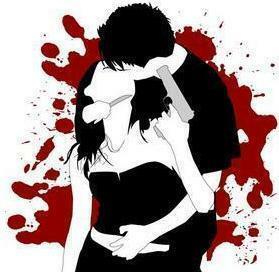 yaa this actually what happens..
trust ur beloved..or else u’ll loose them..and then u’ll loose everything…! Some things are sensitive! Some like these. There’s no substitute to lost faith…..